LISOT News: LISOT's Augie Dale 2nd at Opti Ice Boat North Americans! LISOT's Augie Dale 2nd at Opti Ice Boat North Americans! The 2010 Ice Opti North Americans took place in Charlevoix, Michigan Jan 16-17th. Conditions were prime on Lake Charlevoix, four inches of pristine ice and kids from across the country ready to sail. Ice optis can get up to speeds of 40 mph! Augie Dale was the defending champion going into the regatta, but the 2008 champion, Griffin Sherry was there to reclaim his crown. Like many sailing events on the water, wind is always a factor. The light winds proved for tricky racing. Augie tried a new North Sails experimental cut in the first race and wasn't satisfied with the results. After doing a quick sail change, Augie got back into the groove, but it was too late. He ended up 2nd over all, with Griggin taking the championship. 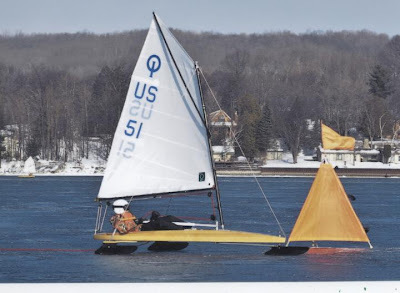 The ice opti is raced all over the world and is a growing class in the United States! If you are ever tempted to so some hard-water sailing - let Augie know!